Granitas are for celebrating. We are doing some celebrating today, won’t you join in? You might know this sweet girl named Megan. She shares her wit and genuine love for food at Wanna Be a Country Clever. And you might know that she’s getting hitched, and it’s right around the corner. 3. and friends to help her celebrate. SURPRISE Megan! We threw you a shower and it’s jam-packed with major flavor and fun. We are so stinking happy for you and Ben! Enjoy your treats and every single moment to come! 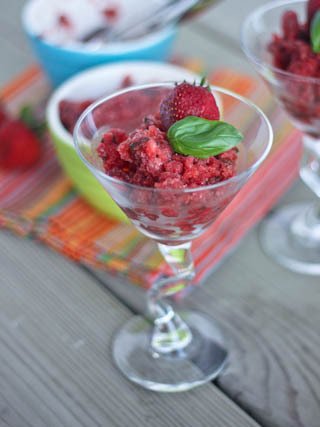 A sweet summer slushy: fresh strawberries, tangy balsamic, sweet basil and tart lemon. In a small saucepan, combine the water, sugar, chopped basil leaves and lemon zest. Bring to a boil and reduce to a simmer over medium heat, stirring constantly until the sugar dissolves and the mixture slightly thickens, 3-4 minutes. Remove from heat. 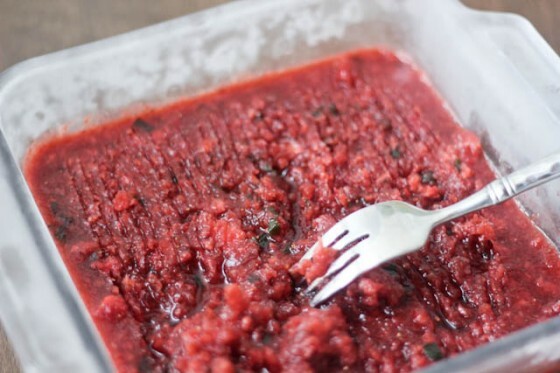 Puree the strawberries using a blender or food processor until smooth. Add the lemon juice and balsamic vinegar and pulse to combine. Pour in the slightly cooled syrup and pulse again just until well-combined. Pour the mixture into an 8x8 baking dish. Cover lightly with plastic wrap and place in the freezer. Freeze for 60 minutes, and then gently scrape the top layer with a fork. Replace the plastic wrap and freeze another 30 minutes, and re-scrape the top layer with a fork. Repeat 2-3 more times until it is frozen through. Divide into four serving glasses and garnish with additional fruit and basil. I have made these with and without adding alcohol. Honestly, I liked them much better without but to make them a little boozy, add 1 1/2 tablespoons of rum or vodka (or your choice of liquor) in with the lemon juice and balsamic vinegar. Megan & Ben, I wish you nothing but the happiest of days as you walk through life together! Such a perfect contribution Cassie! Lovely combination of flavours here. What a fun idea to do for your friend!!! Love this. And your recipe? Okay YUM. I still have some basil that has survived the drought and this sounds like the perfect use for it. We are entertaining over the weekend and this would make such a great dessert after we cookout. Love it! Have a great day Friend!!!! How sweet! Granitas are certainly perfect for celebrating. Can’t wait to check out all of the other contributions! Aww I love MEgan! And this looks like a great way to celebrate! This looks so delicious – might have to make some for my Summer party! Perfect for summer! Love the color it turned out to be! I made my first granita this summer, and loved it. Yours looks awesome. I would have never thought to include balsamic vinegar. What a great surprise! I love to pour a little lemon or lime flavored seltzer water over granita for an impromptu summer spritzer. Very refreshing. Can’t wait to try your version, Cassie. It’s a perfect excuse to toast Megan & Ben and their big day. That sounds so good Cassie! So refreshing! this is so gorgeous + looks so refreshing – yum! What a lovely Hen Do! So delicious and fun 🙂 And this granita is out of control! Balasmic vinegar!? Be still my heart! o.O Cassie – you have just made me drool all over myself with this. Wow! Thank you all so very much for everything, you are all dolls. I kept wondering why the heck my phone was buzzing so much this morning – and SURPRISE indeed!!! I’m so absolutely going to be making these. Like, this weekend. YUM! I want one of these – right now! Cassie this is simply gorgeous. I adore granita and have to try this one. Thanks for inviting me to join you ladies. Wish we could have done it in person. Would have been so much fun. Wow, this is so pretty, Cassie! So pretty, and what a delicious shower you all put together!! I love Megan – definitely wishing her all the best!! I love granita!!!! This looks amazing Cassie! This past week I made a watermleon kiwi granita. I love some basil with my berries! Your balsamic addition is a neat twist, Cassie. Love it! These are definitely celebratory worth! What an amazing line up of treats to help her celebrate with! I still haven’t tried strawberries mixed with balsamic and basil, but I bet the savory sweet combination is to die for. 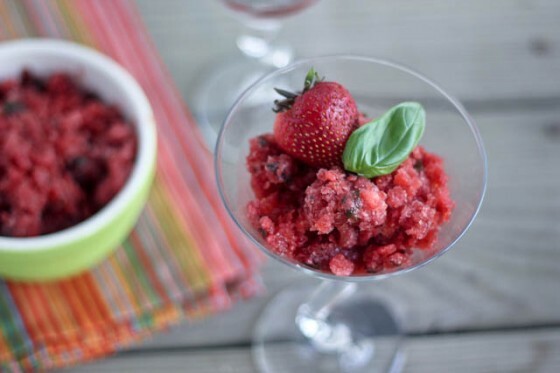 I don’t think I’ve ever had a granita either, so this recipe is high on my radar. They look adorable! What a fun idea! This granita looks so flavorful and refreshing. Love! Yummy, all my favorite flavors! Wow. I was just thinking about making a watermelon granita but this looks so much better. Delish! These drinks are perfect for celebrating! 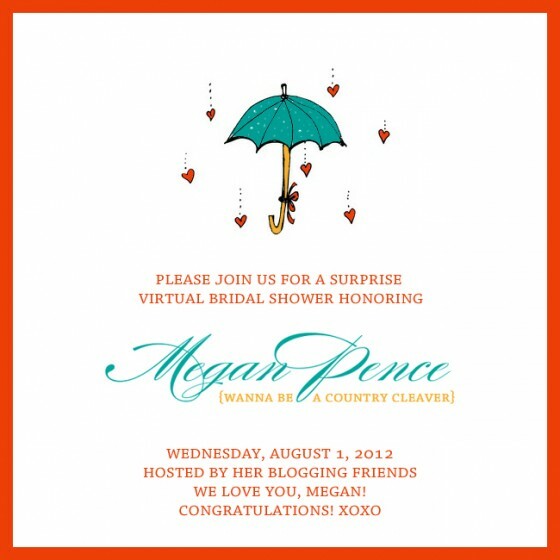 Congratulations to Megan! WOAH! This granita is currently rocking my brain. It sounds and looks incredible. This is a must-make for certain!! This granita sounds so refreshing! Looove it! Love the flavor combination!! And congrats to Megan!! This looks so refreshing! I love surprise showers! Congrats Megan! Oh gurl! Yes please! Bring on the brain freeze! Whoo-hoo! Congrats to Megan! You ladies rock. And you can be your sweet tookus I’ll be making this granita this weekend. Holla! this looks great!! love the martini glass 🙂 thanks for making all this happen!! YAY MEGAN & BEN! I absolutely love the basil-balsamic combo (who doesn’t?!) but I love how you brought in the lemon and the berries – clever and gorgeous and delicious all at once. Wish we could have chatted on a couch over this one in real life! Beautiful and delicious granita! Congrats Megan! Food bloggers are so kind and thoughtful and we’re in such a great community. This looks way too easy NOT to try and what a great reason to top it into a martini glass. Clinks all around! This looks fantastic — and sooo easy! This Granita looks so refreshing for a hot summer day. Love that you added balsamic, perfect with the strawberries and basil…bellisimo! Cassie, this granita looks killer. I love the flavor combination. yum! What a great dessert to entertain with! And this looks amazing! I’ve never made or even had granita before. I absolutely love the color! Definitely looks worth making. What a sweet thing to do for Megan! This is a really great, refreshing drink! Or heck, even dessert! I absolutely love granita and yours looks so good! What a lovely, cool and refreshing treat! It’s pretty too, perfect for a shower! What a perfect granita recipe and a perfect occassion! Love this recipe -so simple, so perfect!